Nathan L. Gonzales of Roll Call’s “Rothenblog” has noticed something interesting about freshman U.S. Rep. David Valadao’s self-description on the primary ballot in California: he has declined to note that he is an incumbent congressman. Incumbents also typically have the advantage in congressional elections. In 2014, however, the anti-incumbent mood may be strong enough that members in marginal districts would prefer not to fact the wrath of the public. Several prominent California Democrats are retiring in the face of an anti-Obamacare backlash. And Valadao, whose district (the 21st) lies in the GOP-leaning Central Valley but is rated slightly Democratic, may fear a partisan backlash in the other direction, even though he won by a comfortable margin in 2012. In California, all candidates compete in one “blanket” or “jungle” primary, in which the top two candidates advance to the general election. 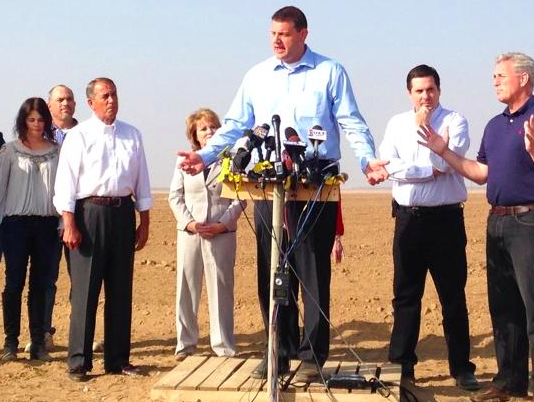 Valadao is facing off against two Democrats, John Hernandez and Amanda Renteria. Candidates may choose their own biographical description on the ballot in California, but a description that is too far-fetched may invite negative scrutiny. In 2012, as NPR’s Tamara Keith noted, Republican Ricky Gill was criticized for describing himself “as a small businessman and farmer, though he’s spent virtually his entire adult life in college and law school.” Ultimately, Gill lost to incumbent 9th district Democrat Jerry McNerny. This article has been updated to note that McNerny is a Democrat.